Through no fault of Dorie’s, this week’s French Fridays with Dorie recipe, Ispahan Loaf Cake, was a complete failure. I don’t know why. There are times when it seems that my subconscious is deliberately trying to sabotage a recipe by doing everything possible to mess it up, and yet it still comes out. Then there are other times when I follow the recipe exactly, and it just doesn’t work. This week fell into the later category. Ironic really considering that “ispahan” is a kind of Rose, and thus this week we were making my namesake cake. 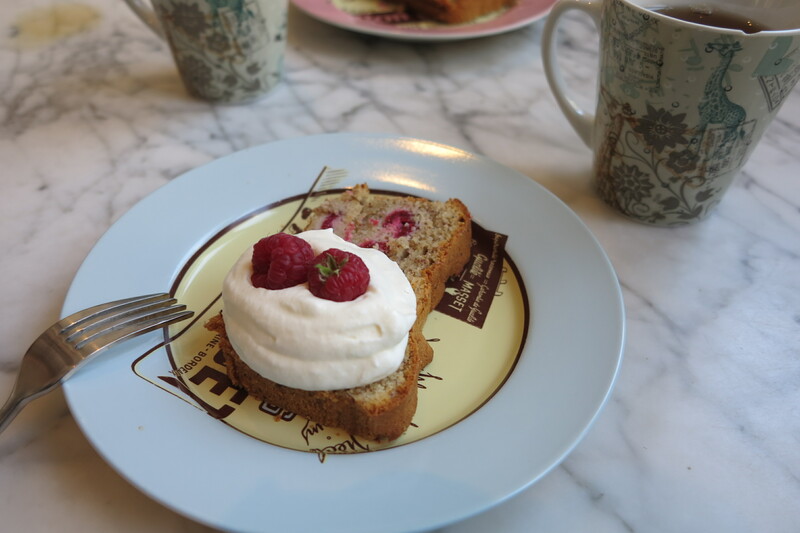 For anyone who is interested in Ispahan Loaf Cake, I encourage you to check out what my fellow Doristas got up to this week. As for mine, well, the darn thing just wouldn’t cook through. Dorie suggests 50 to 60 minutes in the oven. I left mine in for 90 minutes (checking the oven thermometer several times along the way) until the toothpick finally came out clean. But after letting it cool, turns out that the darn thing still wasn’t cooked all the way though. I doused it with whipped cream and hoped for the best. But apparently there are some problems which even cream can’t save. If anyone has any brilliant ideas as to what I can do to use up a massive bottle of leftover rose syrup and extract, I’m all ears! The dollop of whipped cream makes it all look better though. I’m sorry! This made a TON of dirty dishes for a failure. No idea what went wrong, but I know mine took an extended time in the oven, too. Wow, this is a running theme this week! At least you know it’s not just you. My oven won’t go lower than 330 F, and at that temp, it baked nicely in the correct amount of time. Liz is right–this DID produce a lot of dirty dishes for a failure. The oven tº was the issue for most of us, so I guess there´s something wrong there. Too bad you weren´t happy with it… Have a great weekend Rose! So sorry this cake didn’t work for you 😦 I am thinking next time I might just leave my oven at 350. I thought your picture of the cake looked good. Bummer that this didn’t turn out that well! It looks delicious if that is any consolation! I had to turn my oven temp back up to 350^ to get it done and after several more minutes my cake tester finally came out clean. Your whipped cream photo looks lovely. Rose, what a shame, really – because, of course, like Cher already pointed out, this should have been your cake! But a nice save to add a nice dollop of whipped cream and more raspberries to your dessert plate – it does look nice that way! Now, to use that left-over rose syrup, why not try your hand at the Macaron Ispahan….seriously, all those French blogs make it look sooo easy. Have a lovely weekend – and try not to freeze…it is cold here. Aw, I’m sorry you had such a rough time with this one, Rose! You certainly managed to pretty it up with the whipped cream and raspberries – looks good to me! You, me, Mardi… I think, just like with the custard, the temperature should be higher. My husband is thinking that Dorie has a super accurate oven and some of use plebeian don’t. I’m guessing my oven is off by about 25 to 30 degrees. I am so sorry that this one didn’t work out for you. It looks like yours has a tint of pink though! Have a good weekend, Rose. First, check out Diane’s Blog to solve the leftover flavoring problem. She definitely wins this week. I cooked my loaf about 15 minutes longer and then turned off my stove, opened the door, and just let it cool off for an hour as the oven cooled off. It inverted quite easily and was cooked. I think it was just dumb luck that I did that – got distracted with too many chores. And, yes, Rose, this was YOUR week so I am very sorry this didn’t work. You might be comforted to know that it didn’t work for many Doristas. That’s too bad considering the cost of the extract and syrup. I was so hopeful this would be your new signature dessert, and that it would be a big hit with the Doristas. I wasn’t happy with it either, for a lot of reasons. I do like how you artfully covered up the issues with the slice so that it looks just perfect! If you didn’t tell us, we would never have known, it looks delicious with that dollop of cream! It looks good, especially with the dollop of whipped cream. As for your massive bottle of rose syrup, find a good book on mixing cocktails and enjoy. Have a great weekend. I’m sorry your cake didn’t turn out. I had problems with the oven temperature in both this recipe and the cheesy creme brulees, so I definitely don’t think the problem is you…It sounds like cocktails is the way to go with the rose syrup, but I have a feeling I’ll have this bottle around for years. I’m going to try the rose syrup on ice cream later this summer.